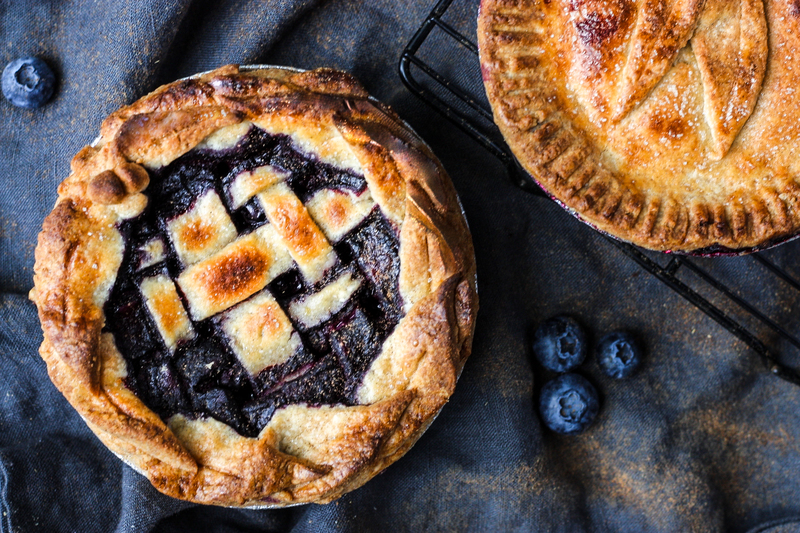 This blueberry pie is low in sugar and full of antioxidants, vitamins and minerals. Perfect for those chilly fall late night evenings. In a large bowl, combine the brown rice flour, oat flour, tapioca flour, xantham gum, cinnamon, sugar, and salt. Sift all together. Cube the cold butter and add to the flour mixture. Start mixing the butter in; using your fingertips until the butter is about pea size. Add in the cold water and apple cider vinegar and start working the mixture into a ball of dough. Needing it until is just comes together. NOTE: If it seems a bit dry add another tbsp of cold water before forming the dough into a ball. Once it all comes together, cover with saran wrap and let it rest in the fridge for about 30 minutes. Place it on a lightly floured clean, flat surface. Roll out the dough until it is ¼ inch thick. Cut the dough into two circles using your pie dish as a guide, and making sure to add an extra inch for extra dough to fold. Place the rolled out dough on to a 8- 9-inch pie pan. Trim the edges to 1/2 inch over the edge of the plan. Place the blueberries, honey, orange juice, orange zest, lemon zest, cinnamon, ginger and cardamom in a large bowl. Gently stir them so that all of the blueberries are coated. Fill the bottom crust with the berries. Roll out the second dough disk over top of the blueberry mixture. Tuck the top dough over and under the edge of the bottom dough, and crimp the edges with your fingers. Place in refrigerator while you make the egg wash.
Place the pie on the middle rack of the oven. Position a parchment lined baking sheet on the lower rack to catch any filling that may bubble over. Bake for 30-45 minutes at 350° or until the crust has browned and the blueberries are bubbling over.